>Meditative absorption in which all dualistic distinctions are eliminated. >To figure out something by meditation or by a sudden flash of enlightenment. >(from Japanese,'zenna' or 'zenno' - from Chinese ch'an-na, or ch'an, - from *dhyana) A coalition of related ways for attaining realization, even beyond enlightenment, of the true nature underlying all appearances, including one's own-and above all, that there is no duality within appearances, but only the one buddha-nature. 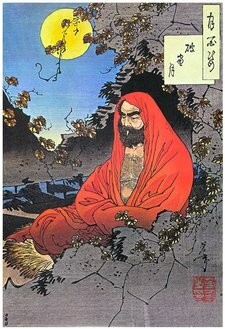 Ch'an/Zen is summarized in the four lines attributed to *Boddhidharma, the key figure who, according to tradition, transmitted the *dharma from India to China. >Japanese; Ch'an (Chinese); a branch of Mahayana Buddhism which developed in China during the sixth and seventh centuries after Bodhidharma arrived; it later divided into the Soto and Rinzai schools; Zen stresses the importance of the enlightenment experience and the futility of rational thought, intellectual study and religious ritual in attaining this; a central element of Zen is zazen, a meditative practice which seeks to free the mind of all thought and conceptualization. >A school or division of Buddhism characterized by techniques designed to produce enlightenment. In particular, Zen emphasizes various sorts of meditative practices, which are supposed to lead the practitioner to a direct insight into the fundamental character of reality. >It is possible for a person to attain enlightenment in this life through the practice of meditation and development of mental and spiritual discipline. Zen means "meditation" and is the Japanese equivalent of the original Sanskrit term dhyana. Japanese art of acupressure to ease tension and balance the body.